Alarm 7: Offer $150,000.00 to murder a Swedish Cartoonist! The leader of an Iraqi group linked to al-Qaeda has offered $100,000 for the murder of a Swedish cartoonist over a recent drawing of the Prophet Muhammad. Abu Omar al-Baghdadi, leader of the so-called Islamic State in Iraq, also threatened attacks on Swedish businesses in a half-hour audiotape posted on a website on Saturday. "We are calling for the assassination of cartoonist Lars Vilks who dared insult our prophet, peace be upon him, and we announce a reward during this generous month of Ramadan of $100,000 for the one who kills this criminal," he said. "The award will be increased to $150,000 if he were to be slaughtered like a lamb." The Nerikes Allehanda newspaper published the drawing, which depicted the head of the prophet on the body of a dog, last month in what it called a defence of free speech. Vilks's drawing was part of a series which art galleries in Sweden had declined to display. Muslim countries including Iran, Pakistan and Afghanistan have expressed anger over the caricature. Iran, the first country to protest against the publication of the drawing on August 27, summoned Sweden's charge d'affaires in Tehran to complain. 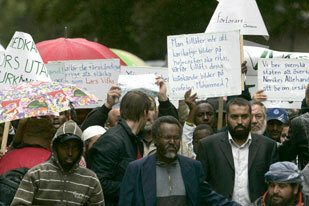 Last year, demonstrations were held around the world after a Danish newspaper published cartoons of the prophet that were reprinted by other European newspapers. Vilks told the Associated Press news agency that he believed the matter had been blown out of proportion. "We have a real problem here," he said. "We can only hope that Muslims in Europe and in the Western world choose to distance themselves from this and support the idea of freedom of expression." Ulf Johansson, the editor-in-chief of Nerikes Allehanda, who is the subject of a $50,000 bounty from al-Baghdadi, said he took the situation "more seriously" than other threats he had received. "This is more explicit. It's not every day somebody puts a price on your head." Al-Baghdadi said in his statement that his group could attack major Swedish companies if Sweden did not issue an apology over the cartoon. "We know how to force them to withdraw and apologise, and if they don't, they can wait for our strikes on their economy and giant companies such as Ericsson, Volvo, Ikea ...," he said. Al-Baghdadi also used the statement to announce a new campaign of attacks during the month of Ramadan that has traditionally witnessed an increase in violence in Iraq. "I am honoured to announce the invasion of the martyr Abu Musab al-Zarqawi [former leader of al-Qaeda in Iraq] at the beginning of Ramadan," he said. He criticised Iraqi groups such as the 1920 Revolution Brigades and Hamas of Iraq, accusing them of fighting al-Qaida, and threatened attacks on the Yazidi minority that was targeted last month by a car bomb that killed hundreds of people. "We can only hope that Muslims in Europe and in the Western world choose to distance themselves from this and support the idea of freedom of expression"